Ahhh…New Year’s Eve. I’ve made it through 45 of them now. Some have been fantastic, some far too dramatic for my liking and many of them were, I’m sorry to say, simply slept through. Last year’s New Year’s Eve was definitely one I will never forget. 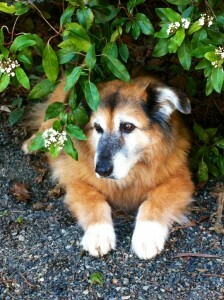 My much-loved old dog, Soda, had a condition called “Old Dog Vestibular Disease.” After spending 4 nights at the emergency vet hospital, they had sent her home because they suspected she would recover much faster under my care. Now in case you haven’t heard of it, Old Dog Vestibular Disease is an inner-ear issue that causes the dog to be completely off balance. It is similar to Vertigo in humans. So although Soda was able to walk, her balance was off-kilter. As such, I didn’t like having her out of my sight for long. However, she had decided that the great outdoors would be far more conducive to her recovery than inside my home. As perhaps you can tell by the above photo, Soda was no lap-dog. She was a Shepherd-cross that weighed over 100 pounds. In other words, Soda called the shots! When she was sleeping in the fenced backyard, I was okay with leaving her alone for small chunks of time. However, when she decided to sleep at the side of the house, I couldn’t leave her alone because it wasn’t fenced – and the road in the front of my house can be a busy one. So when New Year’s Eve rolled around and Soda decided to settle in for the night in the driveway at the side of the house, I adapted. Being a good (some might call crazy) dog-mother, I simply packed up every blanket in the house, the cushions from my couch and a huge camping tarp to cover us both in case it started to rain. And as we lay, side by side, under the tarp in my driveway, I must confess to wondering whether perhaps I was going a bit above and beyond the call of duty to help Soda recover. But then again, I reasoned, if I stayed inside the house, I wouldn’t be able to sleep because I’d be worried sick that she would get up and wander onto the road. So we stayed in the driveway for a couple of hours (I was reading a book by flashlight) and then wouldn’t you know it but the fireworks in my little town started at 10pm instead of midnight. And if there is one thing Soda HATED, it was the sound of fireworks going off. That dog leapt out of our tarp-cocoon, staggered into the backyard, ran straight up her ramp and into the sunroom – no assistance required. What great New Year’s Eve story to remember with memories of Soda.